I'm calling this an "old fashioned" pie because it features a hot water crust and tapioca in the filling...two things you don't see much of these days. This recipe comes from The American Gothic Cookbook, copyright 1979. The small, 62-page booklet was inspired by Grant Wood's iconic painting. Born in Cedar Rapids through the eye, mind, and paintbrush of Grant Wood, the American Gothic couple uniquely reflect the cultural traditions of the Midwest. Here are the recipes from the models who posed for the painting, from the artist who painted them, from people who knew them, and from their neighbors, including the famous. While the Woods and the McKeebys, as their names imply, were of stock from the British Isles, their Iowa neighbors were the Germans of the Amana Colonies, the Czechoslovakians, the Scandinavians, and the Amish of the Kalona area. Part of the essence of the Midwest is the blend of culinary traditions now even including the Oriental. 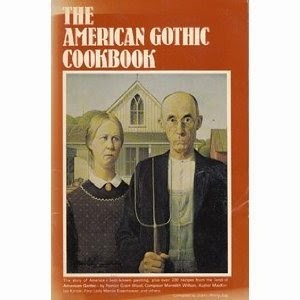 Here are the recipes of the American Gothic people. I bought this book at a used cookbook sale. Considering my love of American Gothic, I had to have it. I referred to this pie as "Raspberry Frankenpie" because I had some problems with the top crust. It wasn't crumbly, but it would break whenever I tried to roll it out or pick it up. So, I pieced it together on top of the pie, going for a patchwork look, and added some "stitches" for decoration. I know what I did wrong. The recipe says it will make two crusts. It does not. So, when I mixed a second crust, I didn't use boiling water...I used the hot water that was left in the kettle without reboiling it. As a result, the shortening never got creamy when mixed with the water. Since the first crust worked perfectly, I'm sure this was the problem. Still, it tasted just fine! 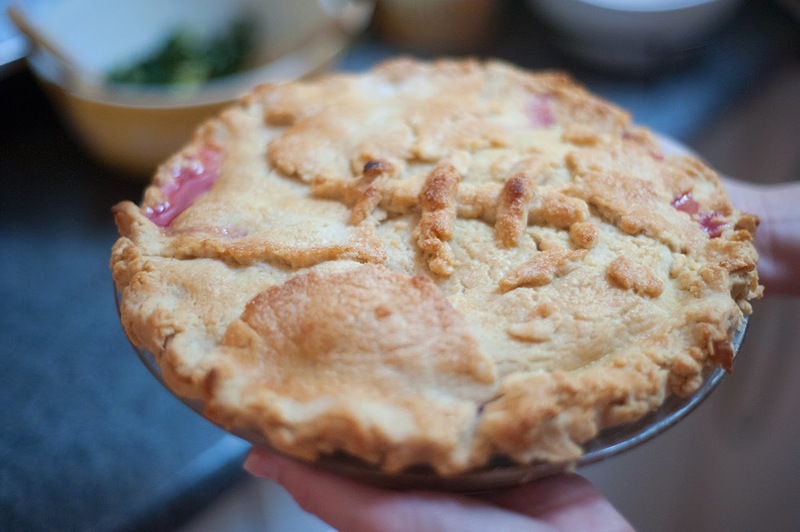 I did miss the buttery flavor of my regular pie crust recipe, but this was an interesting recipe to try...and an easy way to make a crust for those who might be intimidated by making pie. The filling, however, was spectacular. I liked using instant tapioca to thicken the filling as opposed to cornstarch or flour. It created tiny, translucent, fruit-flavored pearls. It wasn't slimy, gelatinous, or chunky (which is what I think of when I think of tapioca pudding). I may use it in all of my fruit pies now! "wife of the man whose face has become famous." I've doubled the amounts, so this will make two crusts. Pour boiling water over shortening and beat until creamy. Sift in flour, salt, and baking powder. Stir and roll out. via her aunt Emilie Steele. * I added the egg wash step to make a browner crust. Mix fruit, tapioca, sugar, and flour in a large bowl. Pour into a 9-inch pie pan lined with an unbaked crust. Dot with butter and add top crust. Bake at 450 for 15 minutes. Lower oven temperature to 350 and bake for 30 minutes more.